The hen harrier (Circus cyaneus) is a species of high conservation concern in Ireland and the UK (Newton et al., 1999; Gregory et al., 2002, Lynas et al., 2008) and protected regionally under The Wildlife Act 1976 and The Wildlife (Northern Ireland) Order 1985. They are listed on Annex 1 of the Birds Directive (79/409/EEC) and considered a UK and all-Ireland priority species (see also recent review in Lynas et al., 2008). The hen harrier in continental Europe and historically in Britain (Watson, 1977) nests in a variety of habitats, including cereals and grassland, although moorland dominated by Heather (Calluna vulgaris) currently appears to be the preferred breeding habitat of British hen Harriers (Redpath et al., 1998). Young forest plantations are used to a lesser extent (Petty & Anderson, 1986; Bibby & Etheridge, 1989) in Great Britain, but nest habitat choices are considerably different in Irish Hen harrier populations with a greater usage of pre-thicket forest habitats utilised for nesting (Wilson et al., 2005; Ruddock et al., 2008; Irwin et al., 2008) and the extremes of tree-nesting also recorded within Northern Ireland (Scott et al. 1991, 1992). However, the foraging requirements of hen harriers are generally biased towards moorland/grassland mosaic habitats which support larger numbers of prey species, such as Meadow pipit (Anthus pratensis) and Skylark (Alauda arvensis), although again in Ireland the use of afforested habitats for foraging appears to occur more frequently than elsewhere (e.g. Norriss et al., 2002; Barton et al., 2006; Ruddock et al., 2008; Irwin et al., 2008). The lack of long-term historical datasets and the considerable differences in habitat usage by Irish hen harriers (O’Donoghue, pers. comm. ; Scott et al. 1991; 1992 Wilson et al., 2005; Irwin et al., 2008) and the reduced mammalian prey assemblage (Hayden & Harrington, 2000) make the understanding of Irish hen harrier population dynamics a high research priority. Thus, regional ecological studies of this species regionally are particularly insightful (see Irwin et al., 2008) within raptor ecology given such stark contrasts to the ecology of the species elsewhere in its range. Hen harriers suffered a large decline in numbers across Europe between 1970 and 1990 (Watson, 1977). While the rate of decline has slowed, and populations in many European countries are now stable, their numbers are currently much lower (Meek et al., 1998; Sim et al., 2001; Barton et al., 2006; Sim et al., 2007). There is a paucity of long-term survey data and knowledge of breeding parameters from most raptor species within the island of Ireland. Decadal surveys or annual volunteer monitoring undertaken for some species e.g. merlin (Falco columbarius), peregrine (Falco peregrinus) and hen harrier provide important insights into the status of these species in Ireland. However, hen harrier populations can exhibit marked inter-annual and multi-annual fluctuations, and such inter-annual variability can complicate wildlife population estimates and management requirements. As such, the data required by managers for monitoring distribution, breeding success and habitat usage is dictated by the quality and quantity of data available to inform management decisions. National surveys are thus an important requirement for monitoring the status of the species in Ireland and the 2010 survey is co-incident with the UK survey and is therefore timely. The designation of Special Protection Areas (SPAs) under the EU Birds Directive, monitoring of status and ecological research are key aims for the conservation and protection of the hen harrier. In Ireland there are six (6) SPAs for hen harriers covering the core of the species’ range in counties Cork, Clare, Galway, Tipperary, Laois, Offaly, Monaghan, Kerry and Limerick. Given the potential for conflict of this species with shooting interests (Etheridge et al., 1997), upland wind farms (Bright et al., 2006; Madden & Porter, 2007) and land-use changes (Madders, 2000; Barton et al., 2006), population monitoring and data on Irish hen harrier demography are the fundamental basis for the establishing conservation status. 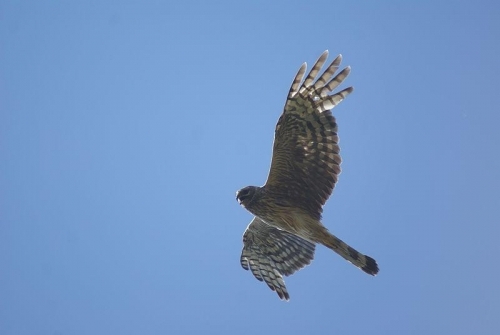 The UK Raptor Working Group recommended that national hen Harrier surveys should take place at intervals of five years, until such time as the population is not threatened by illegal killing (Sim et al., 2007; Anonymous, 2000). Whilst the frequency of illegal persecution is poorly understood and/or under-recorded in Ireland general and local population declines maybe ongoing despite apparent short term increases noted in Ireland (see Barton et al., 2006) and population monitoring during national surveys and annually is vital for the conservation of the species. We consider that the hen harrier is an upland flagship species of considerable interest and, therefore, are interested not only in the species current status but also in raising its profile among local communities and landowners which share and are custodians of the hen harrier habitat and range within Ireland.